Are you a color master? Having extraordinary color vision acuity? 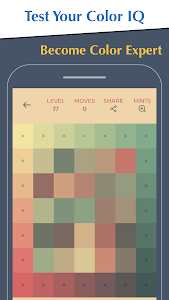 Or looking for a relaxing, beautiful puzzle game? Then you MUST NOT miss this game! 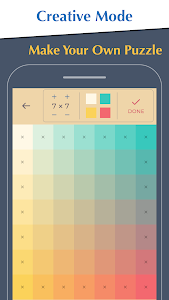 This free beautiful color puzzle game includes 200 levels. 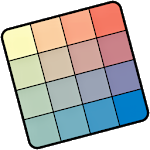 Different game modes and difficulties challenge your color perception! You can play alone, or share your elegant and beautiful puzzles with your friends. Enjoy the journey of becoming color master! ★ Healing color puzzle game, step by step to create your color puzzle. 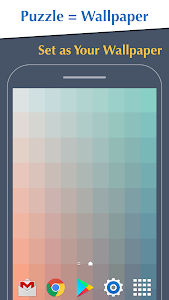 ★ Compare your game scores with the world average and test your perception of color. 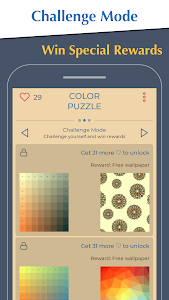 ★ Every completed color puzzle can be downloaded as a free mobile wallpaper. 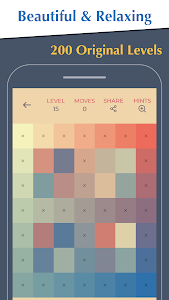 ★ Challenge levels: Complete the level within limited moves, and you can download free limited edition wallpaper. ★ A relaxing game to share with friends via Line, Facebook messenger, wechat, whatsapp and more. Similar to "Color Puzzle Game + Download Free Hue Wallpaper"